Please note that the content of this book primarily consists of articles available from Wikipedia or other free sources online. 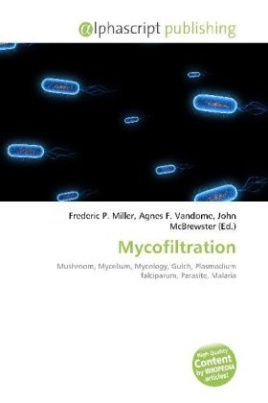 Mycofiltration is the process of using mushroom mycelium mats as biological filters. The term was coined by mycologist Paul Stamets. Stamets originally came up with the technique to control E. coli in the water outflow from his property. After planting a mushroom bed in the gulch where the water was leaving, within a year the coliform count had decreased to nearly undetectable levels. He discovered that the mushroom produced crystalline entities advancing in front of the growing mycelium, disintegrating when they encountered E. coli. As they did so, a chemical signal was sent back to the mycelium that, in turn, generated what appeared to be a customized macro-crystal which attracted the motile bacteria by the thousands, summarily stunning them.